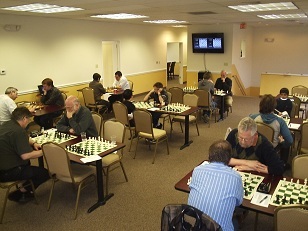 It was another busy weekend at CCFC which featured an all master quad, a strong swiss section and an unpredictable third quad. The top section was won by FM Leif Pressman and NM Ian Harris who tied for first place with 2/3 each. Likewise, Hanon Russell and Daniel Cooper tied for first in the swiss with 2.5/3. Finally, in the unpredictable swiss, it was Brian Bongiovanni who emerged victorious with the only perfect score of the night. Congratulations to everyone and we look forward to seeing you all again next week!